How to better yourself in 2016! Instead of eating Cheetos, you can try Veggie Chips. Switch out hamburger meat for turkey meat. Include fruits or veggies in every meal, such as a small bowl of strawberries or a few carrots with ranch! Look online for different exercise routines, and try those out! If those don’t satisfy you, try creating your own! Let go of the negative energy, and radiate happiness! Let go of the past! The past is only dragging you down. It is a new year, and it is a great time to start over. Let go of the worries, the people, and the problems that were causing you to be upset, and focus on yourself, and how you can be happy! When you find yourself in a situation in which you would usually lash out, or be angry find a way to calm yourself down. Isolate yourself from that situation, or if that is not possible, just keep telling yourself that you will have a better day tomorrow! Valentine’s Day - formerly known as St. Valentine’s Day - was not originally associated with love. There are multiple stories and opinions about how St. Valentine’s Day came about, and they are all deeply rooted in the religion of Christianity. The Catholic Church - a denomination of Christianity - believes that there were three saints that went by the name “Valentine” or a variation of the name. All of them were martyred, which means that they were killed because of their religious beliefs. One of the legends of Saint Valentine is that was a priest that lived during third century Rome. At the time, young men were not allowed to marry because Emperor Claudius II believed that men who were single made better soldiers than men who were married and had children. Valentine thought that this decree was ludicrous because it went against his religion and personal beliefs. ﻿Because of that he decided to carry out marriages for young couples in secret. Eventually his acts were discovered, and the Emperor ordered that he be put to death. So, Valentine’s Day must be placed in the middle of February to commemorate the saint’s death and burial, right? Well, not exactly. That’s just one theory. Some people believe that Valentine’s Day is in the middle of February because of an effort made a long time ago to “Christianize” a pagan celebration called Lupercalia. Lupercalia was celebrated on February 15, and it was a fertility festival dedicated to Faunus the Roman god of agriculture, and the Roman founders Romulus and Remus. Roman priests would gather at a sacred cave where the infants Romulus and Remus were believed to have been cared for by a female wolf. A goat would be sacrificed for fertility, and then a dog for purification. The priests would then take the goat’s hide, cut it into strips, and dip it into sacrificial blood. Then, they would go into the streets and gently slap women and crop fields with the goat hide. The women were far from fearful - they believed that being touched by the hides would make them more fertile in the coming year. Later in the day, all the women in the city would place their names in a large urn. The bachelors of the city would pick a random name from the urn, and become paired for the year with the woman he chose. The matches often ended in marriage. Lupercalia survived until the 5th century, when it was outlawed because it was deemed to be “un-Christian.” Pope Gelasius declared that instead, February 14th would be St. Valentine’s Day, but the day was not associated with love until later. In France and England, during the Middle Ages people believed that February 14th was the beginning of the birds’ mating season. This idea added to the fact that St. Valentine’s Day should be celebrated as a day of love and affection. Gabby: "I believe Valentine’s Day should be all-inclusive. It is a holiday meant to celebrate every type of love - between friends, family, and significant others." Chloe: "I think everyone should be able to celebrate it. Spread the love around just to show how much you appreciate people." Valerie: "It definitely a holiday that is meant to celebrate all kinds of love, however I also think it’s a bit of a scam from store. You do not need flowers and chocolates to show someone you love them, you should have been doing that all year round!" Claudia S: "I LOVE LOVE! I think Valentine’s Day is a great day for anyone and everyone to be expressive and show how they feel." Madi L: "I love the idea that there’s a holiday to show express how much you love someone! Sometimes your life is busy and chaotic, and you don’t always have the time to truly appreciate your loved ones. In this case you can dedicate a day to those you love and appreciate." Alexis T: "Valentine’s Day is meant for everyone. Not just for people in relationships, but it is meant to celebrate all the people in one’s life that they love and makes them happy." If something seems very unhealthy but is indeed healthy, like Banana Nice Cream for example, accept it as a win. This one ingredient, two-step dessert is perfect for anyone, anywhere, and anytime. ​Moving into the fun part: actually cooking. Ease, speed and accuracy are the main principles of cooking . That’s where small, simple snacks like “Peanut Butter Sushi Rolls” come in. They are the perfect after school snack for any student and are so outrageously tasty they’ll all have been eaten before you know it! Small, easy snacks especially after school are so well needed it is almost outrageous. 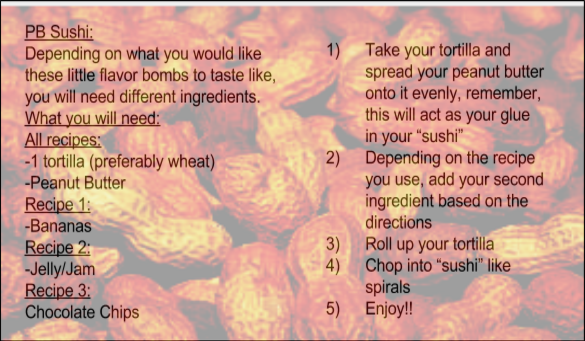 These little peanut butter “sushis” for example are easy to make and easy to eat all too quickly. ​Who doesn’t like Chipotle? Kiss those extra calories goodbye because, luckily for you and everyone else that loves Chipotle, there is such thing as a HEALTHY BURRITO BOWL. Yeah, that’s right. Mind. Blown. With so many options for garnishes and flavor combinations, the possibilities for a delicious recipe are endless. 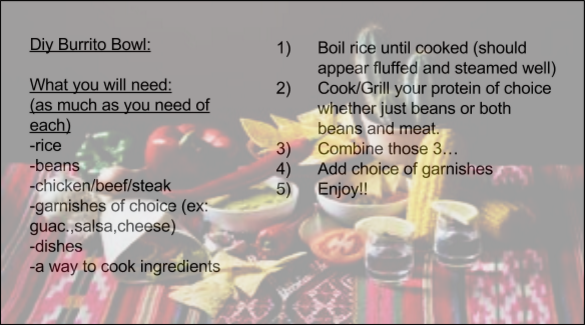 Check out this link for more details and foodie inspiration: http://ohsheglows.com/2015/11/02/diy-burrito-bowl/. ​Still hungry? 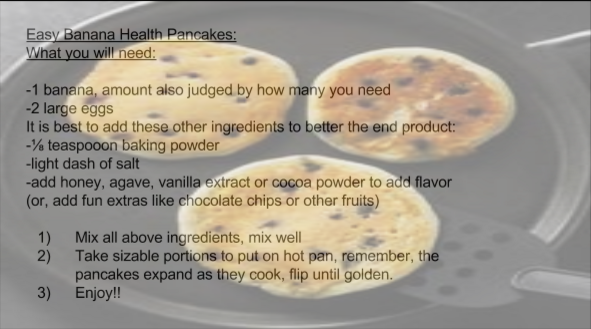 For a 100% gluten free, vegan pancake option (YUM!) click the following link: http://ohsheglows.com/2014/02/25/easy-vegan-and-gluten-free-pancakes-strawberry-shortcake-w-whipped-cream/. love is in the air at reagan! ​When the New Year begins everyone seems to want to undertake drastic changes in their diet, relationships, school, etc. However, becoming and developing into a better person doesn’t quite need those huge all-at-once changes. It can easily be done in simple ways. Going to bed a half hour early could easily improve fatigue and drowsiness that occurs when the body hasn’t been getting enough sleep. Even being able to go to bed at around the same time every night can help the body develop a routine that can help you mentally and physically be ready to go to bed and wake up without any troubles. Skipping dessert one or two times a weeks will help cut back on the unhealthy fat and sugars going into your body. Allowing the body to absorb the ideal nutrients it really needs beside absorbing more and more sugar and fats. It helps keep the body not only in a physically healthy state but can improve mental health as the nutrients absorbed make the body feel better. Though not everyone likes water, it’s good to consume some of it each day. Ideally one should have between 6-8 glasses in a day but again to start off small having one glass in the morning and one glass at night is a good start. After a while it’s a good idea to start increasing the amount of water one drinks. It’s also good to drink cold water because in the morning it helps you wake up, kick starts your metabolism, and cold water burns more calories. Taking a moment to compliment yourself (mainly in your head), though seemingly narcissistic, is actually a self-esteem builder as you try to analyze what part of you you really like. It can even point out some things, in a healthy way, that you can improve like washing your face better, styling your hair, or simply just smiling more. Taking a moment to appreciate yourself is the first step to trying to develop a good healthy image about yourself. So, treating yourself to a good book, a nice shirt, or a movie can make you not only feel good about yourself but reflect on the things you enjoy. You can apply that technique to becoming a healthy stress reliever. There are multiple other ways that other can start small to become more healthier. Talking to your doctor about the more physical changes is a good start. Talking to teachers about academic changes and studying habits is also a good start. Remember that changes like these aren’t physical changes. Some might want to see huge gains right away but these are changes, like many others, that take time to establish. The only gratification anyone needs is the achievement, even as small as these, of taking steps to better themselves. ​This may sound like something a mother would say, but one must always dress accordingly for the weather; a light sweater ain’t cutting it. Especially with the winter here in Wisconsin already getting into full swing, one must always be prepared. Too much exposure could lead to the loss of a limb or even death. The wonderful and terrible thing about living in Wisconsin is that we get cold weather and snow. The snow looks nice; the cold isn’t as nice. When the cold is on, one should come with a jacket, a hat, and gloves because when mother says put on your mittens she means it. It’s either that or a couple less fingers, one less ear, or or a less amount of toes than you originally had. Really, one should feel terrified, especially when having to wait at bus stops, or walk to bus stops, because just the act of being outside during cold weather increases the risk for these events. In the cold things freeze if it is below 32℉(0℃) outside; however, even that isn’t the actual case. Even if it is slightly warmer than 32℉, the windchill factor can make it colder than 32℉, and frostbite is a possibility. That being said, never ever wear shorts in the winter. There is a reason why stores don’t sell them in the winter. The human body needs oxygen in order to work. What frostbite does is it freezes the skin as well as other inner tissues in the limb. Those tissues include besides the obvious skin, veins, muscles, and nerves. In severe cases, everything within a limb freezes causing the limb to die.The limb dies because the veins freeze and blood carries oxygen and if it isn’t somewhere it means that section is dead. When a limb dies, it must be amputated. A limb is a hanging part of a whole body. This includes but is not limited to, fingers, toes, ears and nose; however, pieces of skin can simply become frostbitten. Sometimes a little time in the cold will cause frostbite. Other factors do come into play though, such as being wet and wind chill among others. The colder the temperature the faster frostbite occurs. Hypothermia is another possibility. It is extreme, but considering that it is Wisconsin it cannot be discarded. Hypothermia is serious; it involves the body temperature going down below the normal level for a human. This causes blood to stop flowing to limbs, thus causing the inability to move. All of this is a body mechanism to keep the vital organs moving while sacrificing movement. Really inconvenient in fact, because the whole point is to try and find shelter not get stuck in the middle of nowhere looking for one. This condition can even lead to death if the body temperature goes lower than a certain temperature. The symptoms are very hidden until it gets to its worst stage. They start to shiver, get slurred speech and fumble in hand movements. What must be done is to call for help and get the person to a warmer place. Don’t ever think that anyone can be immune to the cold. Mother says everything because she means it and she is right. So always bundle up or become another number. Cancer is no joke, and it needs more recognition. That is what World Cancer Day is all about. World Cancer Day is about supporting people with cancer and bringing more awareness. It is about showing that you care about the people with cancer and that you care about how much it is effecting our world and coming together to support it and raise awareness. There are many different trends in different counties that raises awareness. A very popular one, from www.worldcancerday.org, is to write a supportive message on your hand using the theme “We can, I can.” This is also this year’s theme and is very effective. This picture can be put on any type of social media to show your support for World Cancer Day and to raise more awareness. There are more detailed steps for this process on worldcancerday.org. There are also many other ides and activities to raise awareness on worldcancerday.org such as posters to print out and other ways to get involved. 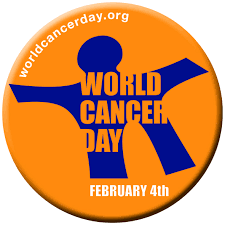 World Cancer Day is very important to so many people across the world. Cancer takes the lives of so many loved ones every year and with added awareness, maybe the amount would go down. The prevention of cancer also needs to be occurring although some are passed down by genetics. There are more than 100 types of cancer that takes lives every year because there is not enough awareness and prevention happening. There needs to be steps taken to prevent the risk of certain types of cancers that are not genetic. With each year the amount of deaths by cancer raises.The amount can go down if we join together and help support, prevent and raise awareness for cancer. World Cancer Day - band together to fight cancer, to support those who have it and to raise awareness to those who know nothing about it. Cancer is not something to joke about; instead it is something that should be taken very seriously. If you feel as though you want to know more about this fight against cancer there are many websites that stand this same belief and want to stop cancer. Join the fight to stop cancer. Together we stand. In the weeks leading up to winter break, Reagan’s Spanish One teacher, Señora Moore, was not shy to express her excitement for the new unit she designed in late 2015. As Spanish 1 students are learning about the ‘present progressive’ (to describe a current event), there are third graders in Madison, Wisconsin, that are furthering their abilities to read and write. In this new unit, Spanish 1 students will be working with these third graders from Madison. “Basically, the Spanish 1 students here at Reagan have all been partnered up with a third grader that attends a bilingual school in Madison,” said Señora Moore. “The Spanish 1 students are going to create a project for their third graders using what they’ve learned, and the third graders are going to create a project for the older kids, using what they’ve learned too, she explained. This project, or “present,” that the Spanish 1 students will each individually create for their third grader, includes either a children’s book, song and recorded music video, or a recorded play. The students also have the option to create a “present” of their choosing, as long as Señora Moore approves of their proposed option. Sandburg Elementary School, a bilingual school in Madison, Wisconsin, educates both native Spanish speakers, and native English speakers. Ashley Painter, a third grade teacher at Sandburg, was more than happy to collaborate with Señora Moore on her new unit. “I feel extremely excited about this project. This is exactly the kind of collaboration we would hope to see in schools. You have students in elementary school and high school genuinely excited about a project. I feel inspired by the students' motivation and enthusiasm,” she stated. Ashley Painter’s third grade students are currently writing autobiographies to give to their assigned ninth grader when they meet in Milwaukee. Both Reagan, and Sandburg’s students are also continuously writing pen-pal letters back and forth to each other. So how did this project come together? In the creation of this unit, Señora Moore knew she wanted to integrate the present progressive, describing location of objects, and to incorporate research of a Spanish-speaking country into the mix. At a department meeting with he World Language Department, Señora Moore asked if anybody knew any bilingual elementary school teachers. Señora Herbst, Spanish 2 teacher at Ronald Reagan, had a friend who was a teacher in Madison, and gave Señora Moore her contact information. “I reached out to her with this crazy long email, pitched her this whole idea, of this project...and at the end of it I was like ‘I realize that we don’t know each other, and that this is a crazy long email, and a really big idea, but if you’re interested at all, just let me know!...And she wrote me back and was just as pumped as I was...And it just kind of grew into this awesome collaboration between me and a lady I’ve never even met before,” Senora Moore explained. Along with this being a fun, exciting new unit for both age groups, this project doesn’t come without its benefits. Both age groups are learning to use their Spanish in an authentic and purposeful way, by having a one-on-one communication experience, rather than sitting in a classroom and learning from a textbook. This is real communication, with real native Spanish-speaking students. “They are writing for a real audience, they are using their Spanish in a purposeful and in meaningful way and it is fun!! School is supposed to be fun, so I am happy they are so engaged,” said Ashley Painter. “This project helps to validate who they are and really elevates the use of Spanish. They are starting to see that being bilingual can expand the opportunities you have and allow you to connect with new people,” she continued. Motivation can be a rather large obstacle when it comes to teaching high school students. Some students are at school to learn, and to put their knowledge to good use, whereas some seem to be going through school just to be successful later on. “I think, sometimes, we have a lot of students here who want to learn a language and are really pumped about it, and then we have students that are like ‘I’m completely doing this because the guidance counselor said I had to, and it’s an IB school and you’re basically forcing me to learn it,’” Señora Moore explained. “Sometimes students, especially at Reagan, put so much pressure on themselves to be a 4.0 student, and they’ve already set their eyes on a particular college, particular career. And I find that there’s always a hefty percentage of students who kind of go through all their classes here, for the A. For the 4.0. For the class ranking. For the possible opportunity to be valedictorian..so that when “real life” starts, they’re set up,” she expressed. When real kids are thrown into the load, the perspective seems to change. A Spanish 1 student isn’t just doing this for themselves, they are putting time and energy into creating this project for their third grader. It’s a new aspect that most Spanish 1 students at Reagan have not yet experienced. “It’s not all about a grade. It makes learning more about how does this help me communicate and be a more holistic person, rather than how is this going to get me into college...Like they’re learning now so they can make this little kid proud, and they’re learning now to teach this little kid something, and they’re learning now so that they can create something that will make the other person happy, and it is bigger than just themselves,” Moore expressed. It seems that, overall, most participants of this new unit are having a positive experience, and are excited for the end results. “The students are beyond excited. They are looking forward to the Milwaukee field trip and they really enjoy reading the letters...The students ask me every morning if they have gotten anything from their pen pal and they are excited about this opportunity,” said Ashley. Señora Moore stated that the only concern received was the students’ worried of letting their little third graders down. She said that the results will be neat, with every student being able to incorporate their own personality to their project, and show their own creativity. Every third grader is partnered to three or four Spanish 1 students, and Señora Moore is excited to see the differences in the projects made for the third graders, using the information received. The Spanish 1 students, along with Ashley Painter’s third graders, have planned to meet in Milwaukee on February 19. “I hope that when the students meet each other in Milwaukee they feel proud of this collaboration and that they remember this experience! We want our students to be proud of their bilingualism and their culture and this project can open the door for that,” Ashley Painter expressed.